George Murray has eighteen years’ experience in education and this is his seventh year as principal at Fisk. 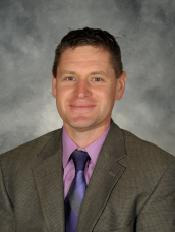 Prior to his arrival, he served as Assistant Principal at Woodbury Middle School and Dean of Students at Salem High School. George’s teaching experience was as a Business and Social Studies teacher at Pelham High School while also serving as the school’s Athletic Director. George is a graduate of New Hampshire College with a Bachelor’s Degree in Business Administration. He earned his Master’s Degree in Education at Rivier College.